In this final post, Deval Desai and Rebecca Tapscott respond to comments by Lisa Denney and Pilar Domingo, Michael Woolcock, Morten Jerven, Alex de Waal, and Holly Porter. 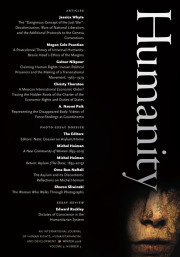 Our paper, Tomayto Tomahto, is in essence an exhortation and an ethical question. The exhortation: treat and unpack R4F (for we limit our observations to research conducted for policy-making about fragile and conflict-affected places) as an institution of global governance, a set of complex social processes and knowledge practices that produce evidence as part of policy-making. The ethical question: all institutions contain struggles over the language and rules by which they allocate responsibility between individual actors (ethics) and structural factors (politics) for their effects—this might be law, democratic process, religious dictate. In light of the trends of saturation and professionalization that we identify (and as Jerven astutely points out in his response, a profound intensification of research), is it still sufficient to allocate responsibility for the effects of R4F using the language and rules of method? The five responses to our piece enthusiastically take up the exhortation. A series of positions are represented: the anthropologist (Porter), the applied development researcher (Denney and Domingo), the anthropologist/practitioner (DeWaal), the practitioner/sociologist (Woolcock), and the economist (Jerven). They unpack the profoundly socio-political nature of the relationship between research and policy from a number of different perspectives: Porter’s intimate view from the field, Jerven’s sympathetic ear in the statistics office, Woolcock and Denney and Domingo’s feel for the alchemic moments when research turns into policy at the global level, and de Waal’s distaste for the global laboratories in which those moments occur, preferring the local re-embedding of research. These all, of course, spatialize the research-policy nexus, just as we do; however, all then ask us to privilege one space over the others. However, all five pieces are less ambitious about the ethical question we pose. They allocate responsibility for the effects of R4F writ-large on the basis of method, asking readers to do so from the space that they privilege. This is most clearly represented in Porter’s generous response, where method is simultaneously a way of doing research and an ethical position in the world. Political questions about her relationship to global governance are deliberately bracketed: we might infer that her methodological commitment to long-term relationships entails a different temporality to the exigencies of development agencies. For Jerven, the seat in the statistical agency means that we should politicize method to make politics better: we want good data for good politics. This logically means we should engage with the political constraints on those who producer of data. For Woolcock and Denney and Domingo, methodologically robust research is similarly a good, but this time at the global level. Rather than argue for politicization, both want us to be more serious about the way in which method allocates politics and ethics—or as Denney and Domingo succinctly put it, to recover the idea that “research is debate” from the assertion that “evidence is proof”, thereby placing the spotlight back on individual researchers, policymakers, and the structures that translate debate to proof. De Waal argues for the inverse of this: why bother with all those nexuses and structures? As with Porter, research method is an individual’s ethical position; for de Waal, it is a political one as well, inasmuch as he’s considered and done away with the casuists at the global level. Global politics and individual ethical responsibility are fused in the moment of (ethnographic) research. Together, these responses all suggest that it is not easy to let method go, that the possibility of truth as a basis for the exercise of power is a hard promise to shake. This brings into focus exactly what we want to problematize in Tomayto Tomahto. We’re not seeking to do away with research, or assert that knowledge has become an alienable commodity. Rather, we look at research systematically (without privileging one site over another), we assert the agency of the researched, and we question whether, in a research-saturated and professionalized world, the regulatory language and rules of method are up to the job of keeping us honest. Is it good enough to think about research in terms of how you conduct it in order to produce a certain type of information or truth? Moreover, might the status quo serve as cover for a different and potentially less appealing means of allocating responsibility (for example, the research supply chain)—one which, before we know it, has becomes an embedded (and thus difficult to change) norm? We note some other efforts to reframe research in our piece. A governmental critique of research substitutes method for technique; it has little space for agency. An actor-network account substitutes method for individual struggle; it perhaps has too much space for agency. Others that we mention tend to be variations on these two themes. We introduce a combination of the profession and the market as the language and rules of research as an institution. This combination is, as Bourdieu makes clear, a common late-modern way in which institutions about knowledge are configured. We believe it offers an intuitive comparison to help us see what a methodological conception of research hides, as well as having a great deal of truth to it. But we also hope that it opens up researchers’ institutional imagination about research. Even if research continues to be about the production of “truth” for policy, what would it look like, and would it be ethically preferable, if we understood research for fragility as a body of legal, rather than methodological obligations? A cascade of fiduciary duties? A set of bureaucratic organizations? Today, researchers and their “subjects” have a concrete understanding of what research is as well as how it should be done. We propose that we should take this as our starting point—and in doing so, recognize the implications it has for ethics, method, and politics. It is not enough to wish them away or to try to account for them. We must recognize research as an institution and treat it as such, rigorously accounting for how the practice of research structures the information we produce. And we can only do so by recognizing how research has changed, and reimagining how we might allocate responsibility for its effects. is a Research Associate with an interest in justice and the rule of law; security and peacebuilding; the law and policy of extractive industries; the governance agenda in IFIs; and research and knowledge production. His research has focused on fragile states, in particular across West Africa. is a PhD Candidate at the Fletcher School at Tufts University. Her work concerns community security initiatives in post-conflict environments, including northern Uganda. Her work has been recognized and supported by the Justice and Security Research Programme (2014-present), the Institute for Human Security (2014), the Fletcher School's Dean's Research Fund (2012 and 2014), and the Feinstein International Center (2010). She has been the recipient of prizes including the Morris Abrams Award (2015), Harvard's Program on Negotiation (2014), and the Alfred P. Rubin Prize in International Law (2011).